Remembering I Can Overcome. For Sheloves Magazine. In the middle of that moment with the cold seeping into joint and marrow, in what felt like an endless night, we couldn’t imagine being warm ever again. We had been hiking down the mountainside all day. The expansive view of the Ozarks still fresh in our memories, we descended into the absolute opposite landscape. My family and eight others had been hiking for four days already. Bone weary, hungry, and exhausted we stood in front of the mouth of a wild cave with our hearts beating loudly in our ears. We walked into absolute darkness and total silence, overwhelmed with the experiences of the past few days and all the emotions they stirred inside of us. That stillness was harshly broken the moment we stepped out of the cave to find a downpour had begun in the valley. We quickly got to work, easily falling into the teamwork we had built. Those best at building shelters set to work with the tarps, finding the few places of flat ground to stay for the night. As soon as one shelter was set up just high enough for us to crouch under, those who had gathered whatever wood they could began stacking it for those of us with knives. Quick but methodical, we shaved off the soaked bark until we reached something inside that was dry enough to burn. Hours later we stood huddled near the fire, arms around each other as much for warmth as to keep ourselves standing. Together we’d succeeded in building a fire in the least ideal conditions. We devoured the food prepared over it, grateful for both the warmth and the sustenance the flames had provided. We coughed as smoke gathered in our tiny shelter. We alternated between keeping warm and turning our faces outward to gasp for clean air. At three in the morning, we wept together as we recalled the past few days. We had done things we never imagined ourselves capable of. We had seen such darkness in ourselves as we grappled for certainty in the wilderness. We glimpsed such light in each other as we banded together as family to carry one another when we didn’t believe we could make it. We felt the deepest cold imaginable as the rushing waters flooded the valley where we stood. We felt the warmth of peace as we sang hymns together and reminded each other that God gave us the strength to press on. Whenever I stare into the flickering glow of a fire, I remember that night. I remember what it feels like to know I can overcome. I’m at SheLoves Magazine today sharing how my experience in one valley mirrors another, how I know God gives us strength for whatever we are facing. 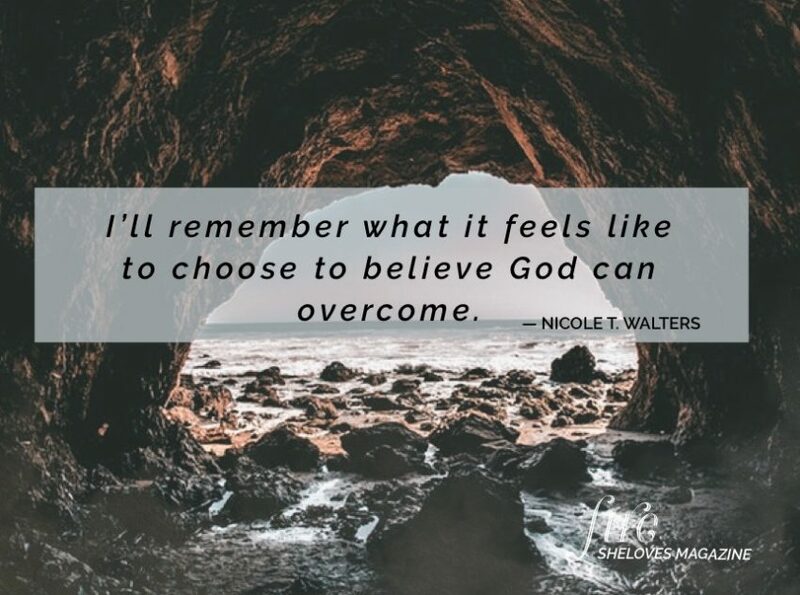 Whatever challenge you face today, will you join me in choosing to believe God can overcome?